Central Kebab House on Sydney Road, Brunswick. We stumbled upon Central Kebab House (661 Sydney Road, Brunswick) as we were wandering around Brunswick, killing time in between my friend's wedding ceremony and reception. The woman preparing food behind the counter looked at us with a smile playing on her lips, perhaps wondering how Simon, dressed in his suit, and I, in a dainty dress, came to sit down at this simple joint to eat Turkish pizza with our hands, a carefree juxtaposition to our formal outfits. She brought us a basket of complimentary fresh, warm Turkish bread, and we reveled in her warmth and hospitality. 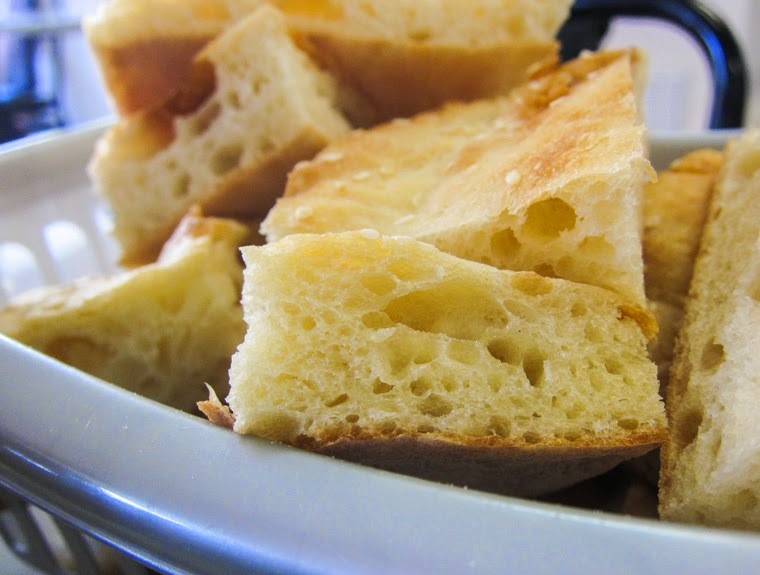 Warm and fluffy Turkish bread. 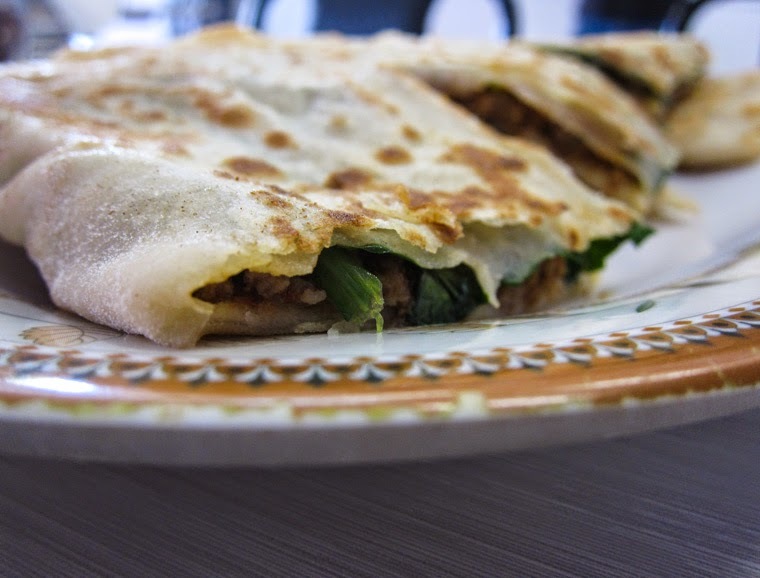 Our mince meat and spinach gozleme had a nice flavour, though I felt that the fillings were a little sparse. Mince meat and spinach gozleme. The Lahmacun - a thin Turkish pizza - arrived. It also came with a plate of fresh onions, tomatoes, lemon wedges, and parsley. 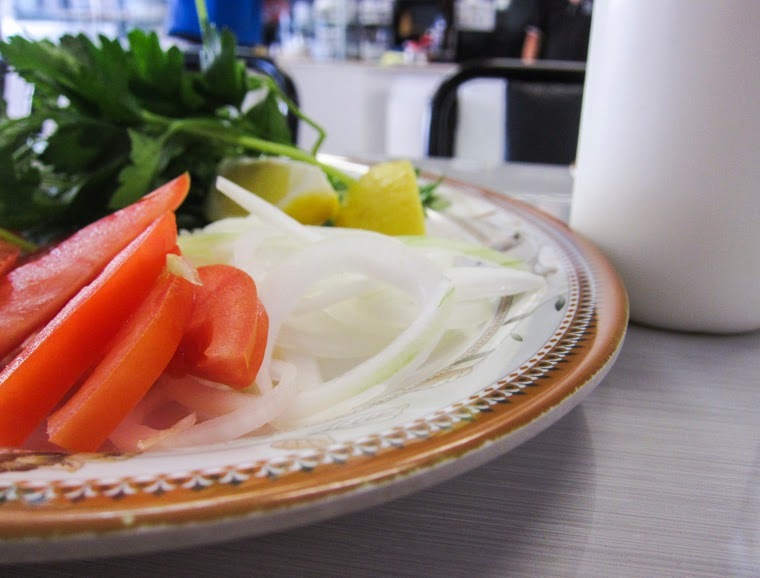 Fresh salad / garnishes / fillings / toppings for the Lahmacun (Turkish pizza). Neither of us have had lahmacun before, and I was wondering how to handle all this when I saw Simon pile on the fresh vegetables along with a squeeze of lemon onto the flatbread-pizza, roll it up, and eat it like a wrap. Of course! That boy is smart, he is. We also shared an Ayran, a Turkish yoghurt drink. With no added sugar and just a gentle pinch of salt, it was refreshingly tangy. 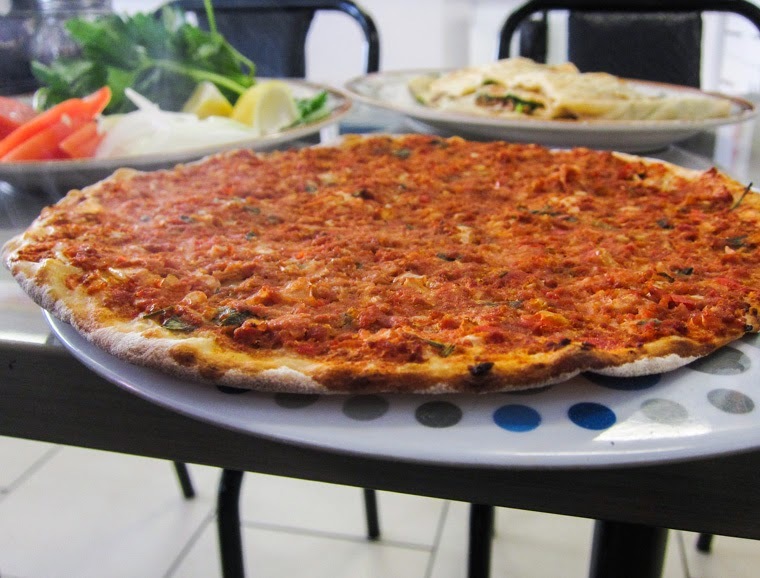 Turkish pizza - Lahmacun / Lahmajun. 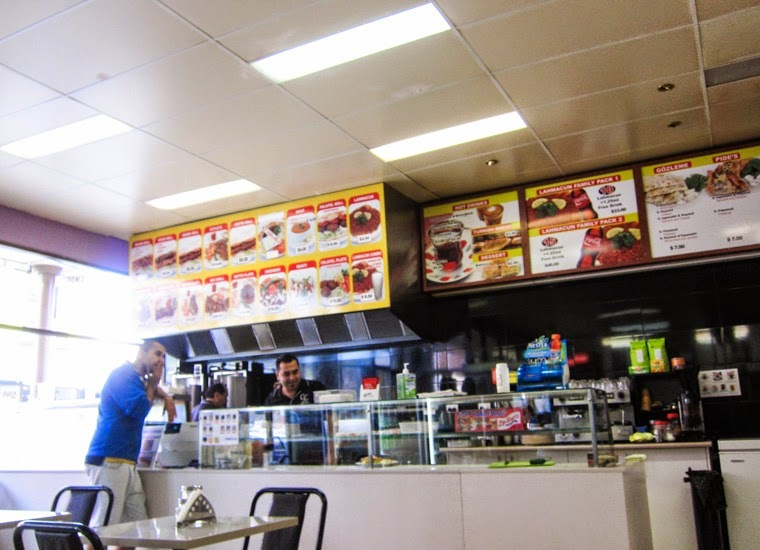 I have had limited experience with Turkish food, and I like how, at Central Kebab House, I get a glimpse of what I imagine to be a place that might be frequented by Turkish-Australians in Melbourne. Many of the items on the wall-mounted menu were unfamiliar to me, and there weren't any descriptive explanations, which made it all quite a fun cultural adventure. If I ever visit this part of town again, I would love to drop by Central Kebab House for round two. I've since found out that one of the mysterious-but-delicious-looking menu items, Manti, is the Turkish version of a dumpling dish, and I am so, so intrigued! Much nicer than wedding reception canapes! Ha! Yes, I like the idea of canapes, but in reality, most events I've been to haven't had very good ones. looks so delicious and just-plain-good! That shot of the Gozleme is enough to make me wanna visit. LOVE!! But I'm like you, not that familiar with food from this part of the world. I keep meaning to return to Bayte in Collingwood but keep forgetting that I wanna go there! I need to try more of this cuisine, for sure. 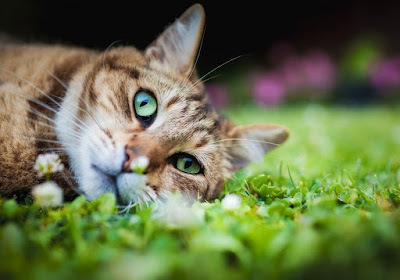 And oh yes, Bayte is lovely! I too need more experience with Middle Eastern Fare. The food I try is always delicious. Thanks for sharing this!